Renault says its new Captur is arguably the most stylish, versatile, frugal and keenly priced addition to the supermini crossover market yet. The car maker has high hopes for the Renault Captur and will be looking to emulate the impressive start for its new Clio, with which it shares its underpinnings and much of its style. With keen pricing and a series of life-simplifing features up its sleeve, it will also be looking to make serious inroads in the booming B-segment crossover class. Led by its sister car, Nissan Juke, the market’s already growing fast on the back of the Mini Countryman and the slightly larger Chevrolet Trax and Vauxhall Mokka. It’s expected to explode even more with the future launches of rivals such as the Fiat 500X, Ford EcoSport and Peugeot 2008. Renault’s latest compact car, Captur (pronounced “capture” in the usual British way, without the ‘e’), takes its name and inspiration from the striking three-door concept from 2011. 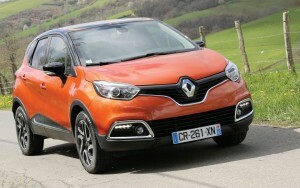 With UK prices confirmed from £12,495 on-the-road, the Renault Captur undercuts the current class top-seller by £500. There are four trim levels for firm’s first supermini crossover: Expression, Expression+, Dynamique MediaNav and Dynamique S MediaNav. The Renault Captur has an impressive specification. The Renault Captur Expression has 16” alloy wheels, 60/40 split and sliding rear seat bench, body coloured bumpers, cruise control, ECO mode (up to 10% fuel saving), ESC (Electronic Stability Control), ETC (Electronic Traction Control), front and rear electric windows, HSA (Hill Start Assist), speed limiter and a trip computer. The Renault Captur flagship is the Dynamique S MediaNav which offers 17” alloy wheels – with a choice of coloured inserts, contrasting roof and door mirror colour, exterior gloss and interior touch packs, a city pack which is essentially electric folding door mirrors and rear parking sensors, heated front seats and extra tinted rear windows. Clever touches for the Renault Captur include zipped removable, wipeable and washable seat covers, dual height boot floor with reversible cover and sliding rear seat bench. There’s also a huge range of options including a reversing camera and metallic paint. The Renault Captur has three engines – 100% turbo – including the all-new 1.2 TCe 120 EDC. Available to order now, the Renault Captur will be in our showrooms from July though, as I keep highlighting, the best way of buying one is very likely to be with a leasing package. This entry was posted in Car Leasing, Car Updates & Releases, Cars, Crossover Cars, New Cars, News and Views, Small Car and tagged alloy wheels, caption, Captur, car, Clio, ECO, Ford EcoSport, lease the Renault Captur, mini countryman, new Clio, nissan juke, Peugeot 2008, Renault Captur, Renault Captur Crossover, Renault Captur Dynamique, Renault Captur Dynamique S, Renault Captur Expression, Renault Captur Supermini, Renault Captur Supermini Crossover, seat, speed, UK by Steve Lumley. Bookmark the permalink.